Unfortunately I was away on my trip to Japan when Rosemary Balmford died on 8 August, 2017. I have learnt of her death on reading a fine obituary by her son Christopher and Kerry Cue in The Age newspaper, 12 October, 2017. I am greatly saddened at her passing, as are many others: see the tributes in The Age during August. Rosemary Balmford was a retired judge, having had a long and distinguished legal career in private practice, in legal education, as a Senior Member of the Administrative Appeals Tribunal (an Australian federal jurisdiction), and in the courts; she was the first woman appointed to the bench of the Supreme Court in the State of Victoria, Australia. She was a member of the Equal Opportunity Board which heard and determined the landmark Deborah Wardley sexual discrimination case. She was also an ornithologist, a keen bird observer who took her interest to the point of publishing books and articles on the subject, and also playing an important role in data gathering on birds; she helped pioneer bird atlassing in Australia. She has also contributed to the activity of many other government and non-government organisations, including the Nursing Mothers Association of Australia, now the Australian Breastfeeding Association. Many thanks to Rory O'Brien at Museum Victoria for help with research for this interview. This interview © Copyright Rosemary Balmford & Craig Robertson, 2008. Music in this podcast includes extracts from John McCaughey's Five Small Pieces played by Larry Sitsky on his album Comtemporary Australian Piano, 1988, and Kate Tempany's Widening Ripples from her suite The Promise of Water (2003), played by Micheal Kieran Harvey on his album rabid bay 2004; both courtesy of Move Records. In my study: notes on the ethical life; what the cases of Lindy Chamberlain, Jacqueline Gillespie, Helen Darville and Schapelle Corby might tell us; see In my study No.10 (4.5 Mb; 9' 51"). Note: This is an extended version of the notes included in the interview podcast which were less descriptive owing to time constraints. See: Evil Angels by John Bryson (Viking, Ringwood, Vic. 1985). 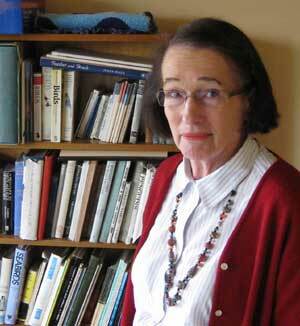 Rosemary Balmford, A Funny Course for a Woman Australian Scholarly Publishing, 2013 (autobiography). Rosemary Balmford, The Beginner's Guide to Australian Birds, with drawings by Rhyllis Plant, Penguin 1990. Helen I. Aston & Rosemary A. Balmford, A Bird Atlas of the Melbourne Region, Victorian Ornithological Research Group, 1978. Rosemary Balmford, Miserable as an Orphan Bandicoot on a Burnt Bridge: Australian Natural History and the Australian Language, Naturae, Number 3 February 1990. Legal Education in Australia: Proceedings of the National Conference on Legal Education, Sydney, 1976, prepared by Rosemary A. Balmford, Australian Law Coucil Foundation, 1978. Rosemary Balmford, The Administrative Appeals Tribunal in Practice, Law Insitute Journal, Vol. 58, 799-809; reprinted in booklet Administrative Law - the profession's sunrise industry, Law Insititute of Victoria, 1984. Rosemary Balmford, Justice and Ethnicity: A View from the Bench: Administrative Appeals Tribunal, in Law in a Multicultural Australia, ed. Greta Bird, National Centre for Cross-cultural Studies in Law, Melbourne, 1991. Rosemary Balmford, The Life of the Administrative Appeals Tribunal: Logic or Experience?, in Administrative Tribunals: Taking Stock, ed. Robin Creyke, The Centre for International and Public Law, Australian National University, Canberra, 1992.